Whereas different information systems exist in Rwanda, a short summary on the crop conditions for decision makers is lacking. SERVIR E&SA in conjunction with the University of Maryland has been promoting regional and national implementation of the crop monitors for agricultural decision making. While SERVIR E&SA’s overarching goal focuses on assisting developing countries improve environmental management and resilience to climate change by strengthening the capacity of governments and other key stakeholders to integrate Earth Observation information and geospatial technologies into development decision-making, the University of Maryland's (UMD) crop monitor collaborators goal is enhancing the availability of food production information within the context of commodities markets and early warning of production shortfalls. Successful implementation in Uganda, Tanzania and Kenya has improved monitoring and reporting of crop conditions through the combination of field data, earth observation data and expert knowledge. This has led to an interest in implementation of national crop monitors in Rwanda where the lack of a clear synthesis and development of a report for rapid assessment of crop conditions and other critical in season information precipitated the need for a National Crop Monitor. The planned implementation of the Rwanda National Crop Monitor will allow for development of synthesis reports drawing information from existing sources and data collection systems such as the MIS (Management Information System), Smart Nkunganire and the Agricultural Land Information System (ALIS). This will allow for development of a timely, accurate and regular actionable information tool, provide a soft copy report that integrates data from different sources, reduce duplication of efforts in crop monitoring, and allow for structured engagements with critical partners and projects. The national crop monitor capacity building sought to build the capacity of key selected technical officers in the application of Earth Observation (EO) data for crop conditions monitoring. The workshop build the capacity of selected participants in application of EO for crop conditions assessment and reporting. 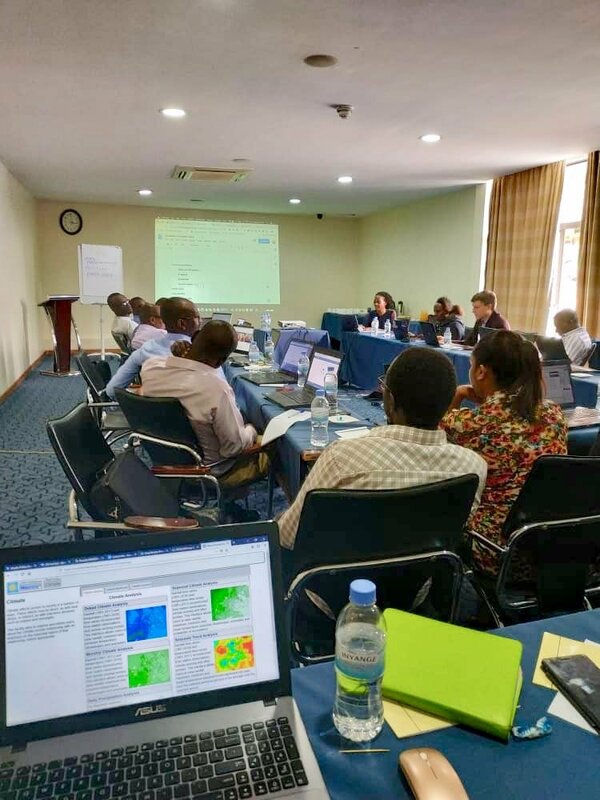 Pre-selected participants attended a five-day intensive training workshop consisting of hands-on training in crop conditions assessment using satellite and field data as well as national assessment report and readily available weather/climate data. Experts from UMD and RCMRD delivered the training. Participants for the training were drawn from MINAGRI, Rwanda Meteo and RAB (Rwanda Agricultural Board). 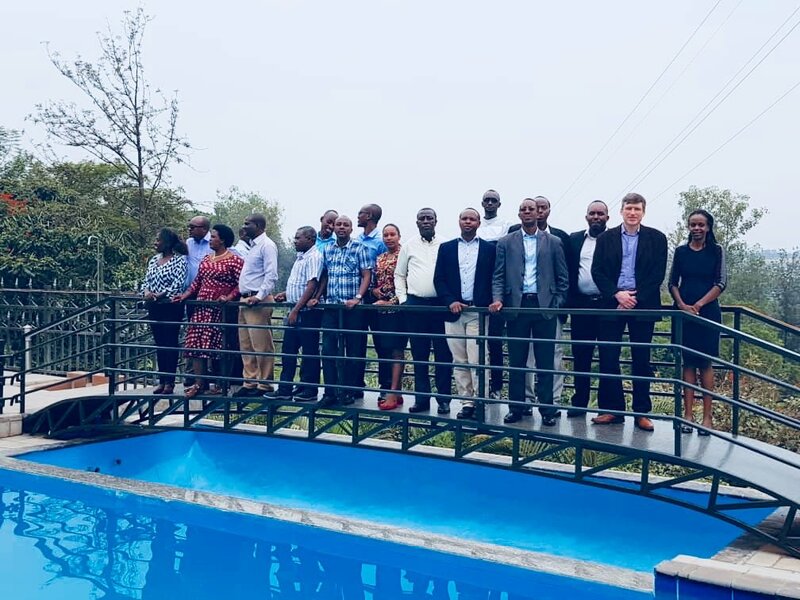 The training focused on discussing the implementation of the Rwanda National Crop Monitor, identifying regional champions to spearhead the process and identifying existing information sources that can contribute to the bulletin. Further, the training focused on building the capacity of the participants on application of Earth observation information for crop conditions monitoring using the GLAM portal, the EWX and the crop monitor portal. Successful implementation of a regional and national crop monitor system, that allow integration of data from existing sources, to provide synthesized briefs for decision makers, has prompted the request for downscaling crop monitoring systems. 20 officers were equipped with practical skills in crop conditions assessment using satellite data from the Global Agriculture Monitoring System (GLAM). They were also trained on using the crop monitor interface for assessing, interpreting and reporting crop conditions by combining EO assessments with field reports. The participants were further trained on synthesis of crop monitor information to develop actionable information in a bulletin as well as developing a roadmap for implementation of the Rwanda National crop monitor. During the training, they discussed reporting timelines, defined roles and reporting structures, bulletin information composition and formats, customizations (reporting boundaries, priority crops, aesthetics etc.). The participants also discussed about the development of a bulletin template and field reporting template. Strengthened practical skills in crop assessments using novel tools for timely reporting on the status of agricultural crops and streamlined crop conditions reporting and synthesis for decision making are expected of the participants after the training undertaken last week between March 4 and 8. The five-day workshop comprised of presentations, extensive hands-on practical sessions, group discussions and experience sharing by participants. Pre- and post- workshop evaluations were conducted, and further training needs assessed. UMD has been promoting regional and national implementations of the crop monitors for agricultural decision making. The monitors provide an easy to use interface for combining earth observation datasets with other sources of information and generating maps on crop conditions at defined boundaries. The Monitors provide the countries and regions the flexibility to define their monitoring administrative boundaries, priority crops, reporting metrics; and provides their implementers with an easy to use interface for reporting the crop conditions and the drivers of other than favorable conditions. The crop conditions determined through field observations and satellite data are combined with monthly and seasonal weather forecasts to provide an outlook for the season’s production. The information is then synthesized into bulletins with narratives and maps for internal decision making and dissemination to stakeholders. The training was led by Dr. Catherine Nakalembe and Dr. Jan Dempewolf from UMD in collaboration with RCMRD/SERVIR staff Lilian Ndungu the Thematic Lead Agriculture and Food Security and Stephen Sande the Technical Expert Agriculture and Food Security.